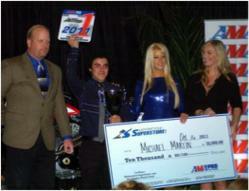 Motorcycle-Superstore.com renews its sponsorship of AMA Pro Flat Track Racing for the 2012 season, becoming the official motorcycle online retail store of AMA Pro Flat Track. The support and dedication that the company has shown to the rising stars in the Motorcycle-Superstore.com Pro Singles division through the year-end points fund is vital to the growth of the sport and is deeply appreciated by the entire paddock. As Presenting Sponsor of the AMA Pro Harley-Davison Insurance Grand National Championship (GNC) and Title Sponsor of the AMA Pro Motorcycle-Superstore.com Pro Singles class of flat track racing for the third year in a row, Motorcycle-Superstore.com is reinforcing its strong commitment to the grass roots support of motorcycle racing. Flat Track represents the genesis of American motorcycle racing, dating back to the early 1900s. The men and women who race the AMA Pro Flat Track GNC careen their bikes around traditional dirt tracks, dragging steel-toed boots and maintaining slides on the edge of control at speeds over 115 mph. The AMA Pro Motorcycle-Superstore.com Pro Singles class is the proving grounds for the future stars of this sport and by sponsoring this class with a $25,000 Year-End Points Fund, Motorcycle-Superstore.com is helping to support the up-and-coming racers who make American motorcycle racing what it is today and what it will become. The 2012 season of the AMA Pro Harley-Davidson Insurance GNC begins today, March 15th-16th, during the historic Daytona 200 week. The AMA Pro Motorcycle-Superstore.com Pro Singles contenders will head to the track this evening to kick off the 2012 season of the AMA Pro Harley-Davidson Insurance GNC Presented by Motorcycle-Superstore.com. The flat track races take place on the short-track oval just outside the Daytona International Speedway’s East Banking. Get your tickets at the track or by visiting http://www.daytonainternationalspeedway.com.